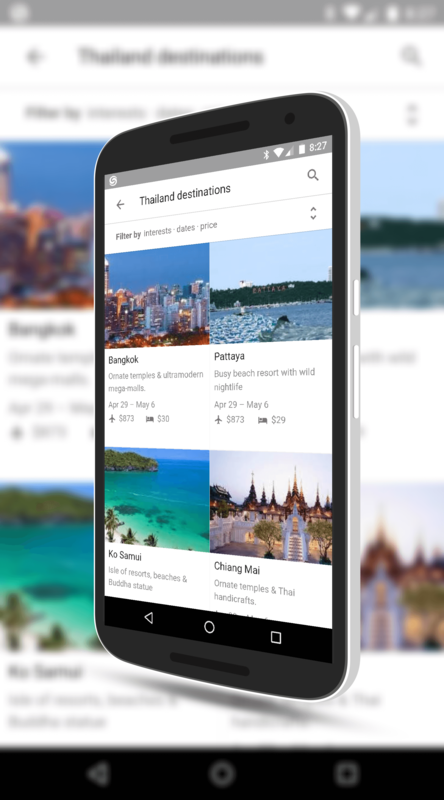 Google has launched a new destinations search results feature in Google Search that will make finding your next holiday destination a bit easier. The new feature brings a wealth of information to your fingertips just by adding the word “destination” to your search. For example, you can search Destination Thailand and you will get a listing of all of the popular travel destinations in that country along with average flight costs and hotel costs in a tile-style results page. based on the weather and seasons, as well as a map of the location. You can filter your results too by putting in activities you want to do or flexible travel dates to get more refined information and locations to fit those needs. As you would expect, as part of the search results, you also get photos and videos from these locations (often other users who have posted pictures and videos) so you can get a sense for what that destination is like in real life. The update to give you these search results are all on the back end of Search so there is no app update or anything you need to do other than add the word “destination” to your searching from the app on your Android phone or tablet. For users, however, there is a wealth of information for you to explorer as you try to find out your next adventure in the world. The new feature works at the country level and not at a state or city level. In other words, you can’t search for “destination Denver” to get results just for Denver as Google outlines in this new feature.